Specification Installation Platform: M1913 Picatinny rail Batteries: 3 xCR123A Lithium 3V Main Flashlight Brightness: 750 Lumens Battery Life for theMain light: 3 Hr. Continuous Operation Navigation Light Brightness: 5-10 LumenBattery Life for the Navigation Light: 60 Hr. Continuous Operation GreenLaser: 5mW Wave Length: 532nm Operation Pull the trigger switch on the foregrip to turn on the unit and turn the mode switch to select different modes.See images above for detail. 1. MOMENTARY ON BLUE/VIOLET LASER WITH TRIGGERSWITCH AT 8' O CLOCK 2. 750 LUMEN WHITE LIGHT WITH STROBE MODE AT 7' O CLOCK3. DIM NAVIGATION LIGHT WITH MOMENTARY BLUE LASER WITH TRIGGER SWITCH AT 5'OCLOCK 4. 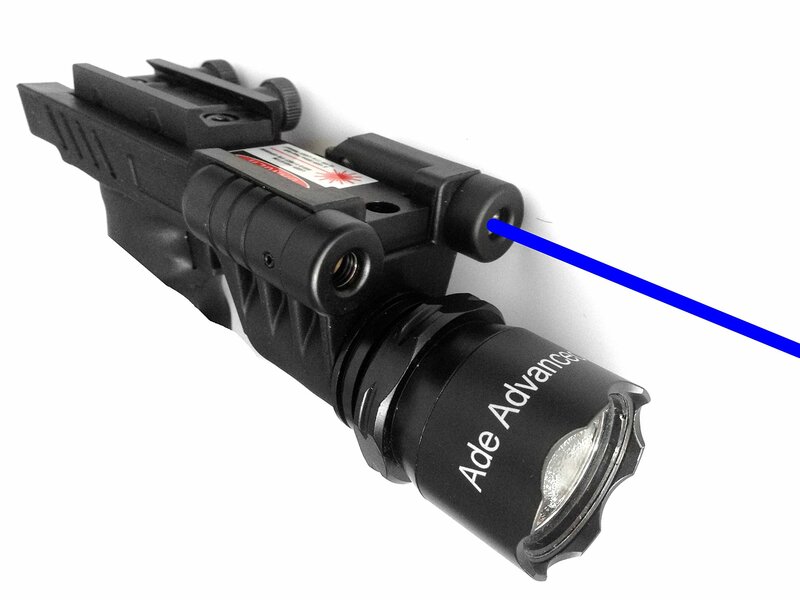 750 LUMEN WHITE LIGHT WITH MOMENTARY BLUE LASER WITH TRIGGER SWITCHAT 4'O CLOCK Content in Package 1 x Ade Advanced Optics BLUE laser and lightcombo 3 x CR123A batteries 2x Allen wrench Instruction sheet.